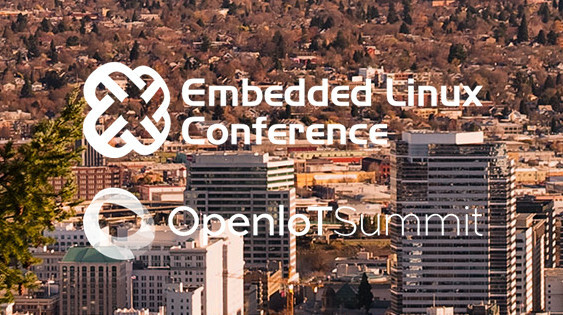 The Embedded Linux Conference 2018 and the OpenIoT Summit 2018 will jointly take place next month, on March 12 – 14, 2018 in Portland, Oregon, USA. The former is a “vendor-neutral technical conference for companies and developers using Linux in embedded products”, while the latter is a “technical conference for the developers and architects working on industrial IoT”. The Linux Foundation has already published the schedule, and it’s always useful to learn what will be discussed about even for people who won’t attend. With that in mind, here’s my own virtual schedule with some of the talks I find interesting / relevant to this blog. 10:50 – 11:40 – Progress in the Embedded GPU Ecosystem by Robert Foss, Collabora Ltd. Ten years ago no one would have expected the embedded GPU ecosystem in Linux to be what it is now. Today, a large number of GPUs have Open Source support and for those that aren’t supported yet, improvements are happening at a rapid pace. In just the last year Vivante GPUs have gained mainline support and Mali GPUs have seen good progress being made. In this talk, Robert will cover GPUs in the embedded space and give an overview about their current status, what lies ahead and how the Open Source state of the art compares to the proprietary alternatives. After eleven 1.x.x releases of Zephyr since the project has launched 2 years ago, the Zephyr project is planning to release Zephyr LTS in 2018 with many new features that have been in the works for the last year, stable APIs and with the goal of taking a subset of the released project code through various certification activities. In this talk the status plans for Zephyr LTS will be presented and discussed and the next steps that the project will take after the LTS release. As we know, the Raspberry Pi is a series of small single-board computers developed in the United Kingdom by the Raspberry Pi Foundation to promote the teaching of basic computer science in schools and in developing countries. Now it is very popular around our IoT world, and you can see many guys use Pi to build great things, and even it can play a role in the production environment. The official Raspberry Pi Linux maintains Linux kernel specific to Pi platform. But it does not include Preempt RT Linux support. Obviously, in some IoT cases we really need to meet hard real time requirement. In this presentation, we will review if-how we can integrate Preempt RT Linux patches to Pi Linux, an see what the problems are for this particular hardware platform. RISC-V a new open source ISA based architecture is rapidly gaining acceptance in embedded space. Several core packages e.g. gcc toolchain, linux kernel, binutils, newlib, qemu has already been ported for RISC-V. At this point, OpenEmbedded is one of first embedded linux distribution frameworks to support RISC-V architecture. This talk will cover the status of support as the core support has been upstreamed into OpenEmbedded-core, additionally SOC layer meta-riscv is also created which would serve as common layer for all RISC-V based SOCs. Bluetooth Mesh is a new standard that opens a whole new wave of low-power wireless use cases. It extends the range of communication from a single peer-to-peer connection to a true mesh topology covering large areas, such as an entire building. This paves the way for both home and industrial automation applications. Typical home scenarios include things like controlling the lights in your apartment or adjusting the thermostat. Although Bluetooth 5 was released over a year ago, Bluetooth Mesh can be implemented on any device supporting Bluetooth 4.0 or later. This means that we’ll likely see very rapid market adoption of the feature. The presentation will give an introduction to Bluetooth Mesh, covering how it works and what kind of features it provides. The talk will also give an overview of Bluetooth Mesh support in Zephyr OS and Linux and how to create new wireless solutions with them. We will also touch upon other tools, such as crosstool-ng and ucLinux, which are peripherally related to building embedded Linux systems. The focus for this section will be to make the viewers aware of these tools as they frequently come up while researching embedded Linux so that you are better informed which tools are available. IoT has many connectivity options and systems based on Low Power Networks(LPN’s) such as LoraWAN are showing a great deal of promise. LoraWAN uses the ISM Band which doesn’t require a license for use. The technology behind LoraWAN, TTN and similar networks. TTN’s impact on public and private LPWAN’s. The initiators and communities that install and build LoraWAN gateways. Lastly we’ll discuss the impact of the deployments in real world use cases. There will also be a live demo of a LoraWAN gateway and node in action on several public networks including TTN as well as others. The MIPI Alliance recently released version 1 of the I3C (pronounce ‘eye-three-see’) bus specification, which is supposed to be an improvement over the long-standing I2C and SPI protocols. Compared to I2C/SPI, I3C provides a higher data rate, lower power consumption and additional features such as dynamic address assignment, host join, in-band interrupts. For the last year or so, Free Electrons has been working with Cadence Design Systems on supporting this new kind of bus in Linux. A quick overview of what the speakers ares going to cover in this session. A brief background on Android common kernels – Out of tree Android patches and how they have evolved over time. The current/active patchset introduction and status – Their use cases in Android and on-going upstreaming efforts if any. A brief Intro to android-mainline-tracking tree. Find/Report/Fix Android regressions or ABI breakages in mainline kernel. Tock is an open-source operating system for low-power ARM Cortex-M microcontrollers that enables radically different kinds of embedded and IoT products. In typical embedded systems, every line of code is fully trusted because embedded operating systems lack traditional isolation mechanisms like processes. Unfortunately, this makes developing secure products difficult, and running third-party applications virtually impossible. Tock uses a language sandbox in the kernel and a process-like hardware enforced mechanism in userspace to isolate third-party and other untrusted code in the system. In this presentation I’ll introduce Tock’s vision for IoT and how its isolation mechanisms work. Then, I’ll use examples of deployed systems and products using Tock to show how developers can use it to build more secure and extensible IoT systems today. Open Source Hardware BoF (Birds of a Feather) session for those interested in how Open Source Hardware design can benefit embedded Linux systems. The session will start will start with a short presentation of a few slides to clarify terminology and highlight Open Source Hardware projects relevant to Linux. The panelists will then lead a discussion with the BoF attendees about the benefits and challenges of designing Open Source Hardware. Jason and Drew can talk about the experience of working with community, manufacturers, and distributors to create an Open Source Hardware platform. Leon can speak about his experience of learning hardware design as a software engineer, and how he took his Raspberry Pi HATs from concept to product. John can speak about his experience leading an Open Source Hardware platform within a large corporation. IoT products are getting richer in their functionality daily, and as a result there is a trend for increased use of Linux in these products. As we are early in the IoT ecosystem cycle, there is a large number of projects and products vying for developer attention as frameworks and protocols to be used in new product development. This talk provides an overview of the options available and how they relate to each other. It covers OS stacks such as EdgeX Foundry, Automotive Grade Linux, Android Things, IoTivity, Tizen, etc.. as well as IoT-tailored cloud integrations from cloud vendors such as AWS, Google, Microsoft. Configurations created for real time applications mostly disable power management completely to avoid any impact on latency. It is however, possible to enable power management to a degree to which the impact on latency is tolerable based on application requirements. This presentation addresses how CPU idle states can be enabled and tuned to allow power savings while running real time applications. The presentation will give a background of the issues faced by real-time applications when CPU power management is enabled. It will then explain tools, configurations and methods that can be used to tune applications and CPU power management in the kernel to be able to save power without impacting the deterministic latency tolerance requirements. As embedded hardware becomes more capable, Debian becomes an attractive OS for projects. Debian provides clear licensing, a solid technical foundation, and over twenty-five thousand software projects already available within Debian. Unfortunately, embedded system projects may make changes to a customized Debian OS in ways that make it difficult to apply security updates or system upgrades. This can lead to an unmaintained fork of Debian with long-standing security vulnerabilities unfixed in the hands of end-users. Nobody likes bit-rot. Many of these common pitfalls can be mitigated or avoided entirely by understanding Debian’s culture, infrastructure, technical norms, and contribution processes. These understandings will improve embedded systems using Debian over the long-term. The Civil Infrastructure Platform (CIP) is creating a super long-term supported (SLTS) open source “base layer” of industrial grade software. The base-layer consists of the SLTS kernel and a basic set of open source software and standardization concepts. By establishing this “base layer,” the CIP Project will enable the use and implementation of software building blocks in civil infrastructure projects. Currently, all civil infrastructure systems are built from the ground up, with little re-use of existing software building blocks, which drains resources, money and time. In this devroom, we’ll share project strategy, use cases, roadmap, milestones and policies. We’ll also share technical details for each development activities for the base-layer that includes open source, real-time development tools, testing and answer questions. 16:30 – 17:20 – 3D Printing with Linux and Xenomai by Kendall Auel, 3D Systems Corp. Selecting the sessions was not easy as most talks are relevant, so I’d recommend checking out the whole schedule.